At this step, provide the geological surfaces that will represents the tops and bottoms of the geological model. 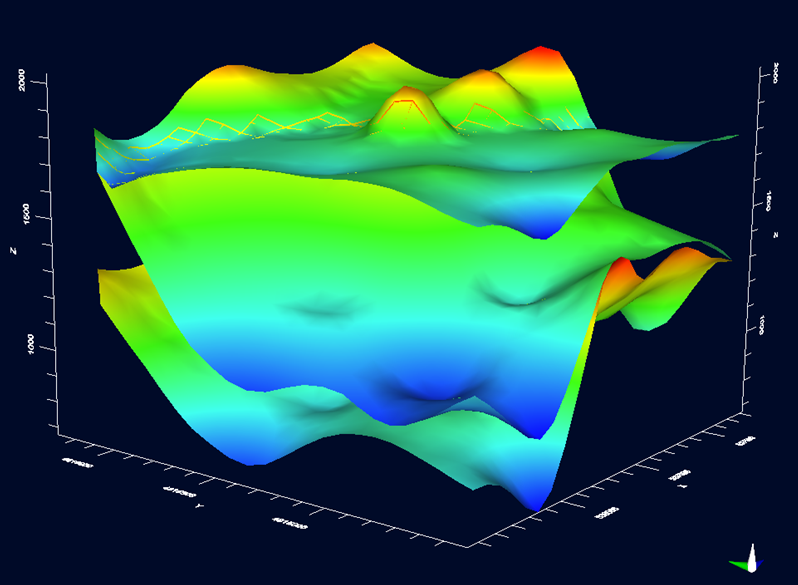 Two or more surface data objects have been created or imported. At this step, you define the geological structure for the conceptual model, by converting surfaces to Horizons. Horizons are stratigraphic layers (2D surfaces with topography) that define the upper and lower boundaries of the structural zones in a conceptual model. 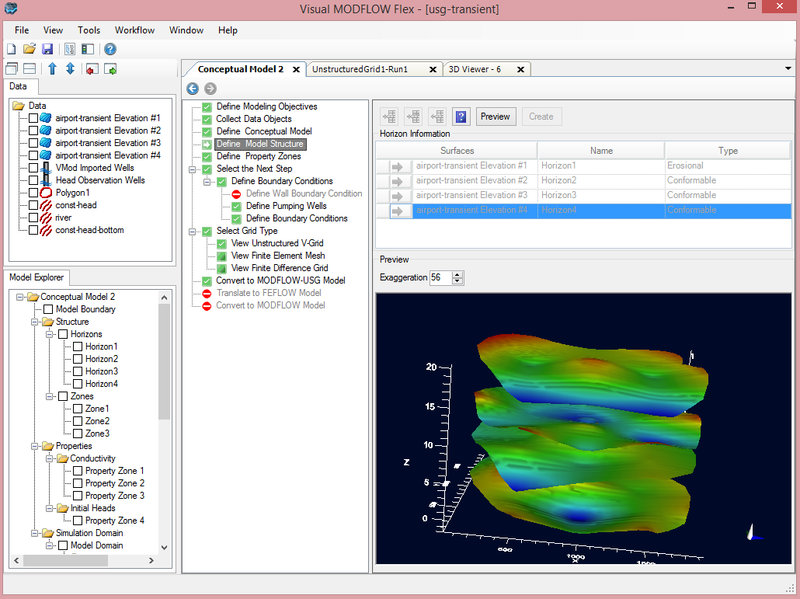 In Visual MODFLOW Flex, horizons are created by clipping or extending interpolated surface data objects to the boundary of the conceptual model. When horizons are created, Visual MODFLOW Flex will automatically generate the Structural Zones (geologic formations) between the horizons, which can be used later to define property zones. 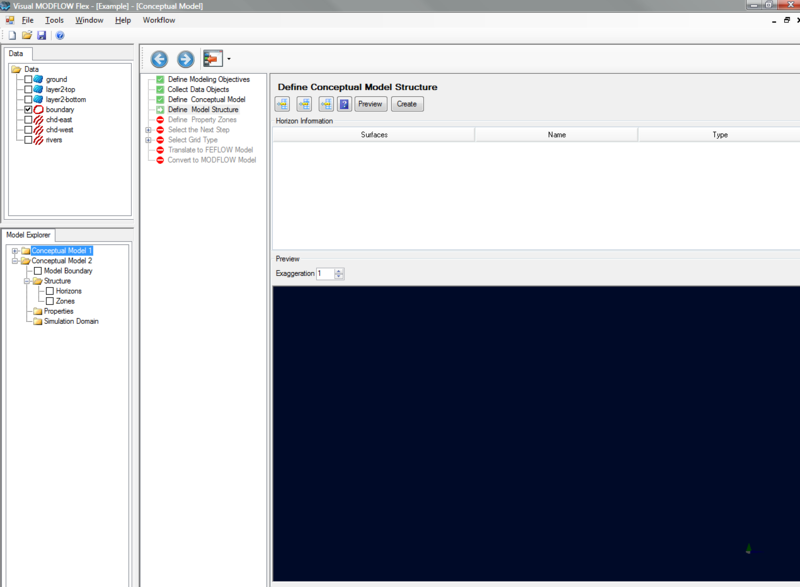 Make sure you have all the surface data objects that you want to use to construct the geological model. Surfaces can be created or imported as explained at the Collect Data Objects step. Also, it is currently not possible to change the Horizons after the model structure has been finalized. 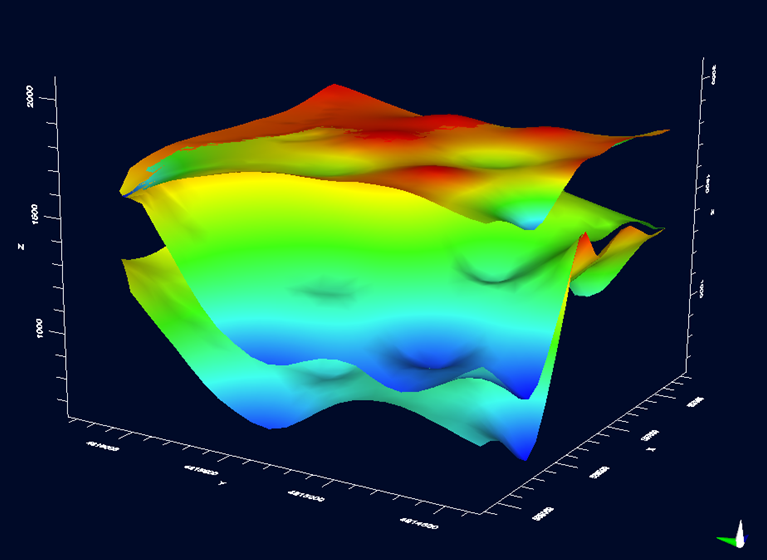 •From the Data Explorer, select the surface data object that will be used to generate the horizon. •Click the Blue Arrow button to insert it into the Horizon Information table. If the selected surface is greater than the conceptual model area, it will be clipped by the conceptual model boundary polygon. If the surface is less than the conceptual model area, it will be extended to the conceptual model boundary. Please Note: Surfaces should be added from top to bottom, starting with the top surface (ground surface) and ending with the bottommost surface. •Click the Add Horizon button to add a new horizon row to the Horizon Information table. •In the Name column, type in a unique name for the horizon. •In the Type column, select the appropriate horizon type from the combo box. For information on each horizon type, please refer to "Horizon Types". •Repeat the steps above to add additional horizons. Remember you must have at least two horizons before Visual MODFLOW Flex can create the structural zones. •You can preview the horizons in 3D Viewer, by clicking the [Apply] button. •Finally, click the [ ] button to create the horizons and proceed to the next step. 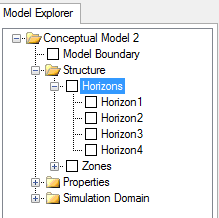 Once created, the horizons will be added to the Model Explorer Tree under the Horizons node (shown below). Each horizon can be assigned a particular type, which defines the relationship to other horizons in the conceptual model. This prevents intersecting layers and establishes layers that satisfy both FEFLOW and MODFLOW requirements. Each horizon type is described below. Erosional horizons can be used as the highest or as an intermediate horizon, but not as the bottom of the conceptual model. This type of horizon will truncate all horizons below it, including the base horizon. Base horizons can be used as the lowest horizon in the conceptual model. Any conformable horizon types will lap onto it, while all erosional or discontinuity horizons will truncate it. Discontinuity horizons represent an erosional surface in the middle of a stack of horizons. It can never be the highest or lowest horizon. Horizons above it up to the next discontinuity or erosional horizon will lap onto it, while all horizons below it will be truncated by it. These horizons can be thought of as the top or base of a sequence. Conformable (default) horizons will be truncated by erosional, base and discontinuous horizons. Lower conformable horizons will be truncated by upper conformable horizons. If a conformable horizon is above an erosional horizon, the conformable horizon will “conform” to the erosional horizon (it will be pushed up by the erosional horizon). The horizon rules described above are applied after all the horizons are calculated. If one of the horizons will be truncated by an erosional, base, or discontinuity horizon, it is a good idea to extend the input data beyond these unconformable horizons in order to truncate them properly. The image below shows three surfaces in a 3D Viewer. The surfaces are colored Red, Green, Blue, from top to bottom, respectively. You will see that there are spots where the green surface intersects with the red surfaces, and likewise, where the blue surface intersects with the green surface. For numerical models (MODFLOW and FEFLOW), this geometry is not permitted (as it will lead to zones with negative thickness), which is why surfaces are converted to horizons. Assigning a horizon type will eliminate the intersections. When horizons are generated from these surfaces, and each surface is set to Conformable by default. Conformable horizons are truncated such that each one conforms to the horizon above it, as shown in the following image. 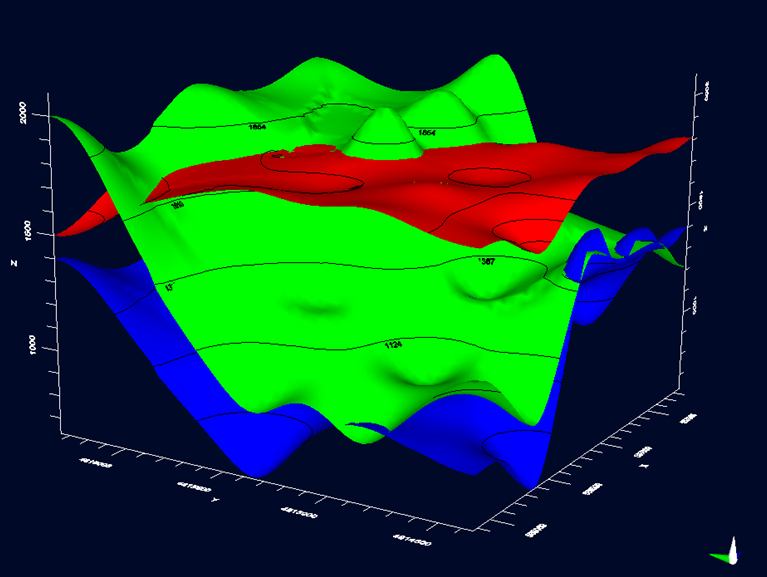 If the middle horizon is set to Erosional, with the top and bottom set to Conformable, the topmost surface (red) is pushed up, as shown in the following image. During the horizon creation process, Visual MODFLOW Flex automatically generates the structural zones between the defined horizons within the horizontal extent of the conceptual model boundary. 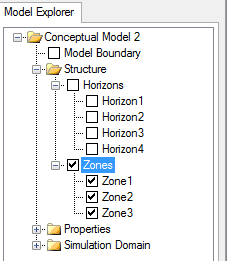 To view the generated structural zones, in the Model Explorer Tree, expand the Structure Node and then expand the Zones node. Zones are given a default name, e.g., Zone1, Zone2, Zone3 etc., which cannot be modified. You can view the zones in an active 3D Viewer window by checking the empty check box beside the zone name. For more information on data viewers, please refer to "Data Viewers" section.